Heliotrope (Heliotropium spp. ): growing, planting, caring. Did you know? The name "heliotrope" derives from the idea that the inflorescences turned their rows of flowers to the sun. 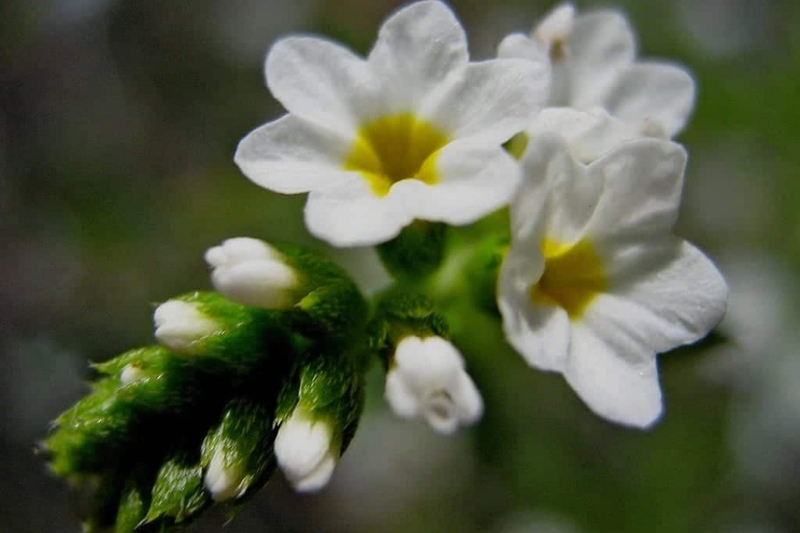 Scientific name : Heliotropium spp. Full description for Heliotropium spp. not yet available. In earth or pot? It's simple, if you do not live in a Mediterranean climate, it will be in pots! Indeed the heliotrope likes the sun and fears the cold as the fresh winds - it freezes when the thermometer drops below -4 ° - or you will have to resolve to grow the heliotrope as an annual. Plant the heliotropes bought in bucket in the spring, after any risk of frost is past due. In pots, plan a mixture of 1/3 coarse sand and 2/3 of potting soil or decomposed compost. To plant in open soil: The soil must be well drained and the relatively cool. If your soil is poor, enrich it with decomposed compost or potting soil. If it is heavy, mix it with 1/3 of coarse sand.- the heliotrope will appreciate! Keep a distance of 30 cm between each plant. Water regularly but not excessively during vegetative growth and flowering. In pots, if you bring in your seedlings for the winter, watering once a month should be enough. You can mulch between the plants - this will limit evaporation from the soil, and thus the need to water and to weed. The heliotrope is frosty - it would not survive a winter outside! If your plant is in a pot and you have a sheltered place remaining at a minimum temperature of 10 ° C, sufficiently lighted, get it back in for wintering before the first freezes. Water very few during the winter. From early April, you can put your heliotropes out in the light. If your heliotrope is in open soil and you can not imagine that it survives the winter, tear it off before you see it freeze! In areas with a mild climate, you can try wintering it in open soil a new year by cuting it close to the ground and mulching it carefully. You can of course choose to put it back in pots, by taking out the whole root ball (without breaking or cracking it, if possible) with a spade. It will then be necessary to put the pot in a shelter for the winter.